This weekend I attended the 2010 Festival Of Cartoon Art at Ohio State University. The conference happens once every three years in Columbus, OH and is sponsored by the Billy Ireland Cartoon Library and Museum which is a phenomenal facility dedicated to comic arts education and research. I had been planning for this conference for months and have to say that it was well worth the wait. The Festival Of Cartoon Art has been happening for 30 years and provides a nice intimate environment for cartoonists and cartooning enthusiasts to get together and celebrate comic art. Though I have attended a variety of comic art related events this was the first I had ever gone to that put the majority of its emphasis on comic strips which was a welcome change. This presentation enlightened me to a whole new world of vocabulary (try saying metalepsis ten times fast) and managed to explore some interesting conventions that only the comic medium is capable of utilizing. 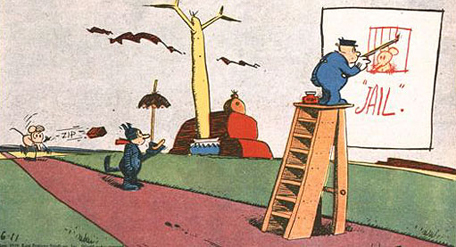 The conference also marked the 100th anniversary of George Herriman’s Krazy Kat which was a newspaper strip that ran from 1913 to 1944. This was celebrated with another academic panel of paper presentations, a speech by Michael Tisserand (an author who is writing a biography about George Herriman), and a reception at the Billy Ireland Cartoon Library And Museum in which they were showcasing a Krazy Kat exhibit. 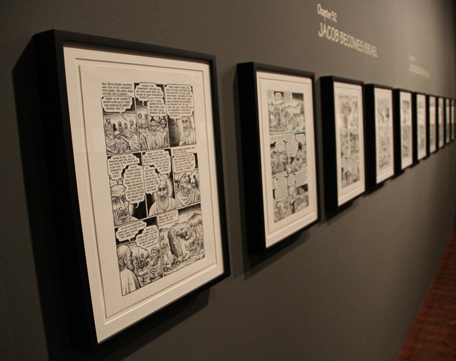 It was inspiring to see the way in which a single comic strip can live on after so many years. If you are not familiar with Krazy Kat I strongly suggest picking up a reprint of the strip at your local library. The remainder of the conference (Friday, Saturday, and Sunday) consisted of presentations by working cartoonists and comic historians as well as numerous opportunities to socialize and network. I would guesstimate that out of the 250 people who attended the conferences about 75% of them are registered in the National Cartoonist Society (NCS). The NCS is a group of cartoonists, often times believed to be elitist in nature, that offer inductions through a rigorous application process. This process verifies that your living comes from cartooning and acceptance to the NCS is determined by the perception other NCS members have of your work. Basically, it is very difficult to join the NCS and only the best of the best are permitted to join. By having the opportunity to surround myself with all of these working NCS professionals I was granted a sneak peek into the life of the working cartoonist and I loved every second of it. Presentations ranged in topics from the history of DC comics and how to make a living creating web comics without the backing of a newspaper syndicate to a tribute to former King Features Syndicate editor Jay Kennedy who passed away in 2007. 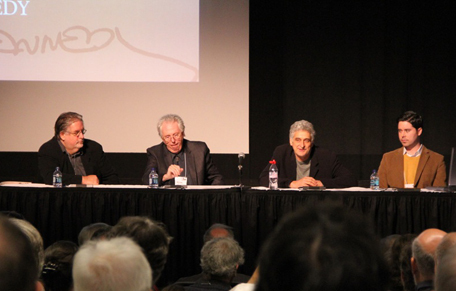 The picture above is from the Jay Kennedy Tribute featuring Matt Groening (Life In Hell, The Simpsons, Futurama) , Bill Griffith (Zippy The Pinhead), Patrick McDonell (Mutts), and Brendan Burford (the comics editors for King Features Syndicate). Each presentation was packed with great information but more importantly each gave me a creative rise I had not felt in quite a while. Being jammed into a room with 250 other people that have the same passion as you can change your mentality in an instant and if that collective thought process allots a positive vibe the possibilities are endless. Throughout the weekend I managed to have discussions about punk bands with Matt Groening and Jen Sorensen, discuss my love of Will Eisner with Bill Holbrook, better understand newspaper syndication through Jan Eliot, and form awesome new friendships with fellow comic lovers Jeremy and Dan Juravich, fellow cynic Stephen Johnson, and fellow filmmaker Joel Schroeder. The whole weekend left me energized and feeling confident that I was in the right place for once in life. The comics community is the nicest group of people and they truly understand how to support one another. Despite the fact that I was the worst artist in that room, everyone treated me as an equal and encouraged me to start my own comic. With that said I am going to do my best to start another website, www.zlorya.com, which will hopefully turn into a venue for me to host a weekly webcomic of the same name. To make a long story short (too late! ), this weekend has empowered me and hopefully some great creations should be just over the horizon. After I polish off my animation this week expect some awesomeness. P.S. Since I didn’t fit this into the above writing I think the following information may interest a few of you. 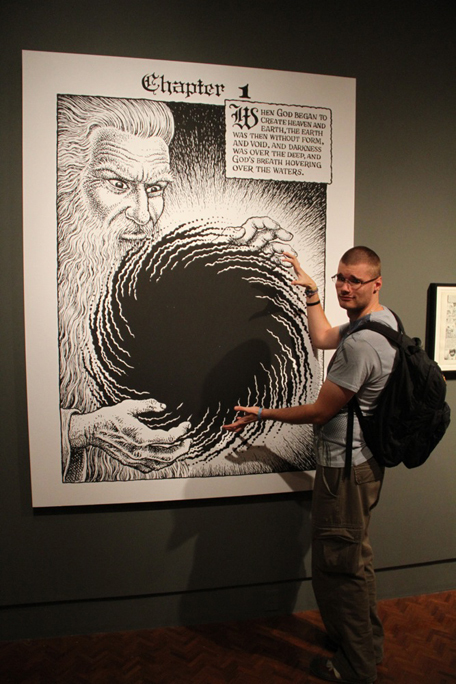 The Columbus Museum Of Art had an exhibit featuring all of the original artwork from R. Crumb’s interpretation of The Book Of Genesis. It was a fascinating exhibit and was my first chance to see Robert Crumb’s art in it’s purest form (seeing as drawings he has done on diner place mats sell for $2,500 a piece I probably will never own any of his work). The man’s line work is always spot on and nothing truly compares to it. I believe the exhibit is traveling between different museums; if you have a chance to see the work I highly suggest it. Crumb is one crazy visionary. P.S.S. The other exhibit within the Columbus Museum Of Art was called Furs, Fins, And Feathers which was intended to showcase art that incorporated different animals in a variety of mediums. 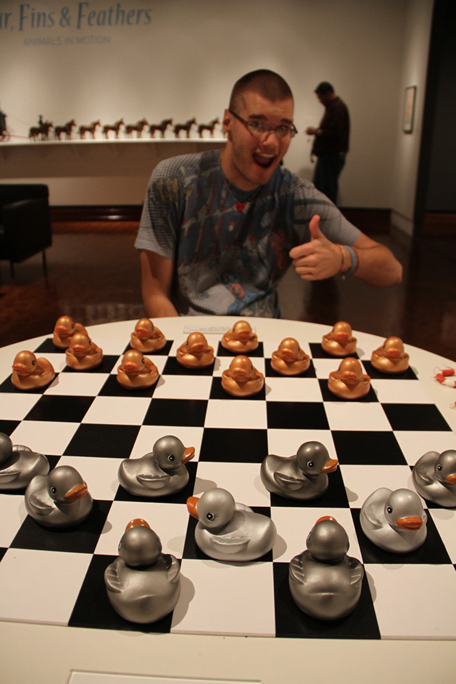 One of which was a sweet checker board consisting of different colored rubber duckies. 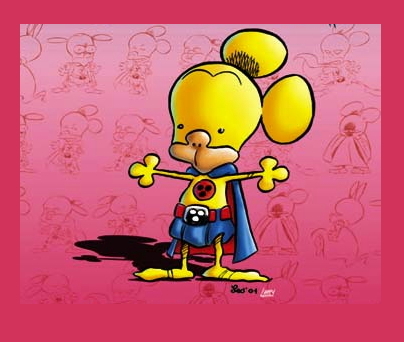 If you managed to attain King status your ducky wears a decorative lifeguard tube around his/her neck. Unfortunately, LA destroyed NY as my buddy Joel managed to kill my ducky platoon.